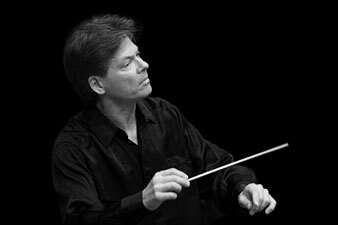 Frank Cramer was born in Essen, Germany, were he studied conducting at the Folkwang University of the Arts. He completed his studies at the University for Music in Hamburg with Horst Stein. After his first engagement at the State Theater in Oldenburg, he performed at the Theatre of Würzburg in the position of the vize principal conductor from 1980 88. In result of his celebrated success with Verdis Aida in the Arena Sferisterio di Macerata in 1989, Frank Cramer has been invited to concert halls and opera houses throughout Europe, the USA, Eastern Asia and South Africa. He conducted at the opera houses of Zurich, Basel, Bern, Vienna, Hungarian State Opera Budapest, Semperoper Dresden, German Opera on the Rhine Düsseldorf Duisburg, Darmstadt, Trieste, Korea National Opera Seoul and Pretoria. His broad repertoire ranges from Mozarts’ Le Nozze di Figaro to Wagners’Tristan und Isolde and Strauss’ Salome to Bergs’ Wozzeck and Lulu. International critics characterize Frank Cramer as a conductor who, in a very unique way, combines inspiration, intensity and expression with naturalness and professional skill. In concerts Frank Cramer favors the composers Beethoven, Mozart, Mahler and particulary Bruckner. Further more he devoted himself to non main stream composers like the late romantics Zemlinsky, Korngold, Stephan and Nielsen or composers like Messiaen, Lutoslawski, Schönberg, Berg, Webern and Ives. His immense concert repertoire results from his long term cooperation with orchestras such as the RAI National Symphony Orchestra Turin, the Orchestra della Toscana Florence, the Orchestra dell' Arena di Verona, the Bern Symphony Orchestra, the Radio Symphony Orchestra Basel, the Bamberg Symphony Orchestra, the WDR Cologne Radio Orchestra, the Jena Philharmonic Orchestra, the Real Symphony Orchestra of Sevilla, the National Orchestra des Paysde la Loire, the Helsingborg Symphony Orchestra, the Philharmonic Orchestra of Nice, the Orchestra of the Teatro Lirico di Caligari, the Philharmonic Orchestra Budapest, the Hungarian National Philharmony, the Korean Symphony Orchestra and the KZN Philharmonic Orchestra Durban. Frank Cramer has been invited to many Festivals such as the Biennale Munich, the Budapest Spring Festival (Hungarian National Philharmony), the Music Festival Mecklenburg Vorpommern the reputated Seoul International Music Festival and the Tongyeong International Music Festival in South Korea. Numerous radio and television productions for the West German Radio, the Bavarian Radio, the ZDF, the MDR Leipzig, the Swiss Radio DRS, the South Korean Radio and Television KBS, the South Korean Television Arirang and the Radiotelevisione Italiana (the RAI National Symphony Orchestra Turin) show his artistic work. For the CD Label Dacapo, Frank Cramer recorded the complete symphonies of the Danish late romantic composer Ludolf Nielsen with the Bamberg Symphony Orchestra and the Danish Philharmonic Orchestra. The CD label Marco Polo published Louis Spohr’s Violin Concertos No. 3 and 9, which Cramer recorded together with the Slowakian Radio Symphony Orchestra and the violin soloist Christiane Edinger. From 1988 to 2009 Frank Cramer worked as professor for conducting at the University of Music Karlsruhe | Germany. In 2009 he is nominated as professor for opera and music theatre at the University of Music and Dramatic Arts in Graz | Austria. In 2008/09 among others he gave his debut at the Semper Opera Dresden, as well as with the Belgrade Philharmonic Orchestra and conducted symphony concerts in Germany, Austria, Italy and South Korea. 2010 Frank Cramer, conducted the Korean prèmiere of Alban Berg's Lulu at the Korean National Opera at the Seoul Arts Center.This performance was broadcasted by the South Korean Television KBS. He also performed Symphony concerts with the Jenaer Philharmonics. At the Art University of Graz | Austria Cramer conducted the productions Le Rossignol / Gianni Schicchi, Dafne and Le Convenienze e le inconvenienze teatrali. 2011 he recorded works of the Danish composer Finn Høffding with the Jena Philharmonic Orchestra on CD for the label Dacapo and directed Symphony concerts in Germany and Austria. 2012 he gave his debut at the KZN Philharmonic Orchestra Durban | South Africa and conducted the productions Hänsel und Gretel, Il matrimonio segreto, L'heure espagnole and L'enfant et les sortileges at the KUG Graz. At the Frédéric Chopin Music University Warsaw he held a course for the masterclass on orchestra conducting. In 2013 Frank Cramer performed his debut with the Korean Chamber Orchestra at the Seoul International Music Festival a.o. with Bartóks Music for Strings, Percussion and Celesta at a concert broadcasted live by KBS and television recording by the South Korean TV Arirang. At the KUG Graz he conducted the production The Merry Wives of Windsor. 2014 Frank Cramer once more conducted concerts with the KZN Philharmonic Orchestra Durban, South Africa and the Korean Chamber Orchestra in Seoul. At the KUG Graz he performed the productions Don Giovanni and Le Convenienze e le inconvenienze teatrali. At the Graz Opera he conducted the Austrian premiere of the opera Der Satanarchäolü genialkohöllische Wunschpunsch of E. Naske in coproduction with the Theater Luzern. 2015 Frank Cramer returned to the Folkwang University of the Arts Essen and conducted a symphonic concert with works by Debussy (La Mer), Kohl ( polarlys. world premiere) and Rachmaninow (Symphonic Dances). At the KUG Graz he directed the productions The Magic Flute as well as Daphnis and Chloé and Monsieur et Madame Denis by Jacques Offenbach.